We love using seasonal ingredients and you cannot get more seasonal that zucchini blossoms. The window of opportunity with the blossoms may not be as narrow as you’d think, especially if you grow zucchini and squash plants, because they flower everyday. (BTW, squash flowers are very similar but are more delicate). This year we had an abundance of blossoms from a ‘ornamental’ squash plant (yes, you can eat the blossoms). We picked the blossoms at dawn each morning, collecting them in a container and storing them in the fridge. We already used them to make fritters, pasta and used as a pizza topping. This recipe for risotto if bright and colorful because of the zucchini, zucchini blossoms and carrots. 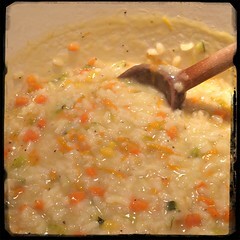 The carrots also help balance the flavor while adding a more intense orange which brightens up the risotto even more. It’s beautiful. Directions 1. Heat 3 tbsp olive oil in a dutch oven and sauté the vidalia onions and garlic until translucent. 2. Add the diced carrots and diced zucchini and cook until they become slightly tender. 3. Add the butter, let melt and then add the Arborio rice and mix well until all grains are coated with the butter and oil. Cook until the grains absorb the liquid and you can begin to smell the rice toasting. 5. Add the wine, mix well and heat until the liquid is absorbed by the rice. 6. Following the same procedure, add 1 cup of stock and wait for the rice to absorb before adding another cup of heated broth. 7. Before the last cup of stock, fold in the chopped zucchini flowers and Pecorino Romano cheese. You can add some salt (to taste) and black pepper. 8. Add the last cup of stock and cook until the risotto is the consistency of your liking. 9. Add in the lemon juice and 1-2 tbsp of olive oil in the end. 10. Garnish with fresh chopped flt-leaf parsley.